Provides a daily source of 100% natural soluble and insoluble fibers. The typical American diet is low in fiber. Health professionals agree that increasing daily dietary fiber helps promote natural regularity as well as overall health*. By supplementing your daily diet with ULTRA-FIBER Balanced Fiber Supplement Caplets as directed, you can add up to 30% of the recommended daily value of fiber to your diet. ULTRA-FIBER Balanced Fiber Supplement Caplets are the smart, convenient way to boost your fiber intake. Does Ultra-Fiber Balanced Formula contain grapefruit? No, Ultra-Fiber Balanced Formula does not contain any grapefruit or grapefruit juice. They contain citrus fiber from oranges. What are the main ingredients in Ultra-Fiber Balanced Formula? Each Ultra-Fiber Balanced Formula caplet contains approximately 375 mg insoluble fiber and 375 mg soluble fiber. What is the expiration date for Ultra-Fiber Caplets? Because Ultra-Fiber Caplets is a dietary supplement, it is not required to carry an expiration date. However, we do monitor the physical integrity of the product for five years following the date of manufacture. If you would like to contact us and provide us with the lot number, we can tell you when the lot was manufactured. 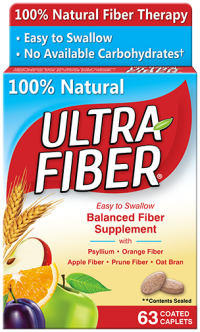 What is the dosage for Ultra-Fiber Balanced Formula? The dosage for Ultra-Fiber Balanced Formula is 2-4 caplets with a full glass of water before or with meals, 3 times daily. Be sure to read all product package label Directions, Uses and Warnings and follow them carefully.